Worm guard revolutionized the way we use the lapel. But what if it gets stuffed by passers? Here's a lapeloplata study to help improve your game. 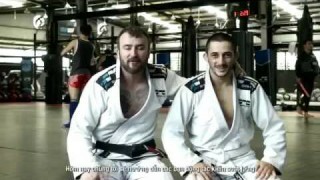 Bjj Scout presents Andris Brunovskis at Pans 2017 with an interesting take on the wormguard using the belt (not lapel) instead. Thoughts? Good method of using the gi lapel from DeLa Riva Guard to get an easy back take! Some great submissions and a sweep from the Back Lapel Guard. The control is really strong and blocks the opponent's upper body. Sweep and submit with a Triangle choke from the Worm Guard. Rodrigo Aquiles from Alliance Rio shows us an amazing setup for an Armbar from the Lapel guard. 15 seconds explanation of this Armbar from the Worm Guar by Keenan Cornelius. Victor Estima shows how to avoid a guard pass, control the lapel and end up submitting by Omoplata. Sweep or take the back and choke the hell out of your opponents using this great technique from the Lapel guard.